Barely seven years ago Joe and Kathleen Camp entered the world of horses without a horse or a clue and very quickly found their questions steering them into uncharted and controversial waters on a collision course with the ultimate discovery that most "domestic" horses in the world are being kept and cared for in a manner that is diametrically contradictory to their genetic design. Since that moment they have both become passionate advocates for change. Kathleen is a lawyer specializing in litigation and is now teaching American Literature at The Webb School. Joe created the international canine superstar Benji and wrote, produced, and directed all five of the Benji movies and various television programs. His recent book The Soul of a Horse is a national best seller and in its ninth printing. Even with all the accomplishments and media exposure, Camp is still in awe of his own success. “Inside, I’m still a kid sitting in a dark theater in Little Rock, Arkansas, watching Disney’s ‘Song of the South’ or reading books like the Black Stallion with happy tears rolling down my cheeks,” he says. “To be able to bringt that kind of happiness to others is very special.” For more, click on the About Joe & Kathleen link in the header bar above. A longer, happier, healthier life for all horses. The publication of Joe Camp’s first book, the national best-seller The Soul of a Horse, was a pivotal moment for horses all across the world. A milestone, and a cornerstone of discovery of what horses have known for millions of years but what humans are only beginning to fully understand. This book, and those that followed, including the recent highly acclaimed Born Wild, have changed and are continuing to change the lives of thousands of horses (and people) all across the planet. It is the purpose of this Foundation to promote, preserve and perpetuate Joe and Kathleen’s discoveries and teachings until every horse on the planet has the opportunity to live as he or she is genetically designed to live. The Soul of a Horse Foundation is a 501c3 non-profit organization devoted to 1) vigorously encouraging, supporting, and undertaking the legal fight against the Bureau of Land Management and others who are breaking federal law in effort to diminish or do away with the wild horses living in the American west.… and… 2) furthering the discoveries, research, concepts, and empirical experiences of Joe and Kathleen Camp… and… 3) encouraging others, through workshops, research, experience, and science, to have the courage to allow their equine partners to live as closely as possible to how their genetics intend them to live. 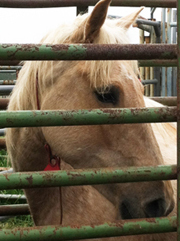 The Foundation will be a staunch advocate for organizations attempting to mount effective legal actions against the Bureau of Land Management and others who are violating federal law in an effort to to reduce or do away with the wild horses in the American west, and The Foundation will, itself, undertake such legal actions against the Bureau of Land Management and others. These magnificent iconic creatures who evolved for 52 million years right where they currently live are a national treasure on numerous levels not the least of which is that they provide a living, breathing laboratory of details on how the horse can survive and thrive. A textbook on how we should and can be caring for those which come into our lives. We will support to the best of our resources and ability the legal and public awareness efforts to restore these horses to the life and land unanimously granted to them by congress in The Wild Horse and Burro Act of 1971. An act being violated by the very government agencies charged with enforcing it. Where does all this end? Unfortunately with us. All of us. And the only way to lasso, hog-tie, and force the BLM to change is with the law. The courts. And to do that, lawyers are needed who can donate time to lawsuits against the BLM. If you’re a lawyer, please consider this. I believe it’s the only ultimate way to save what’s left of the horses in the wild. The only way to finally bring the BLM to its knees. If you’re just a lover of horses or a concerned citizen and know some lawyers, please tell them about it. And maybe donate some money to help pay for lawyers who cannot afford to donate their time. The ultimate solution, in my humble opinion, lies there. In hammering the BLM in the courts with facts and law so hard and so often that they lose enough to be forced by the courts to buy back cattle grazing rights on public lands that were designated for the horses in the 1971 Law. And to return the horses to those lands they were granted. And to allow the cougars, bears, and wolves and other wildlife to restructure the natural ecological balance required by the law. It’s a long and winding road, but it can happen. It should happen. But only we can make it so. Clinician Ray Hunt always opened every clinic or symposium the same way. “I’m here for the horse,” he would say. “To help him get a better deal.” He and his mentor, Tom Dorrance, were the first to promote looking at a relationship with the horse from the horse’s perspective. Their question was never What’s in it for me? But rather, What’s in it for the horse? During our relatively short journey with horses we began to understand early on that “What’s in it for the horse?” should be the only question. And not just related to training, but to Lifestyle, Diet, Feet, the concept of Liberty, as well as Relationship. And that only by understanding all of these from the horse’s perspective could we begin to approach that illusory state of mind referred to as Horsemanship. Only by seeing the world from the horses’ end of the lead rope. Giving them the choice of choice. And caring enough to want them to be healthy and happy. The Foundation will create and grow an endowment which can finance the maintenance and preservation of all of the efforts of Joe and Kathleen Camp for the benefit of the horse including The Soul of a Horse herd, and will promote, preserve and perpetuate Joe and Kathleen Camp’s discoveries and teachings long after they are gone. The Foundation will provide Joe and Kathleen Camp to appropriate groups and organizations for seminars, workshops, and training sessions related to the mission of the Foundation and will pay travel costs when the group or organization qualifies and cannot afford said costs. The Foundation will also present sponsored seminars, workshops, and training sessions at the Camp’s property and elsewhere. The Blog – Follow our journey with an amazing unhandled mustang and her new baby. Those who recall Noelle & Malachi know why the first post-video is entitled Here We Go Again.